My father was very proud of his links with Cardiff Stuart Hall Corps of the Salvation Army. 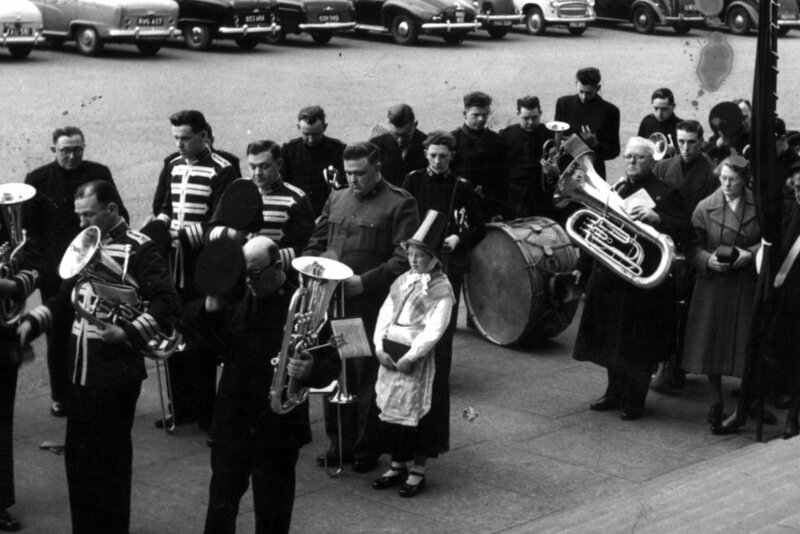 The Corps had a great tradition for fine Salvationism and music-making but closed in the early 1960's when the Hayes district of Cardiff was being redeveloped. The hall was demolished in 1965 and I can remember looking up at the building (behind David Morgan's - opposite the little arcade that was home to the Sarsaparilla Shop!) with scaffolding outside - which is rather remarkable considering I must have only been about 2 and a half at the time. I do not know when this photo was taken - I would guess somewhere around 1960.It appears to be a during prayer at the beginning or end of an open-air service. My father is holding a trombone, already an SA officer and wearing a grey uniform. His brother Trevor is on his right while his youngest sister Marilyn is in traditional Welsh costume to his left. My grandfather, Arthur Harry, is two to Trevor's right with the dark-rimmed glasses. Going on appearance (although I'm sure someone could confirm or otherwise) Ernie's son Les is the principal cornet player. les was later bandmaster at Cardiff Canton Corps and he and his with Maureen remain family friends to the present. Les now attends Penarth Corps and still holds a season ticket at Ninian Park. They have always been very close to my Aunty Dorothy, who also now lives in Penarth and attends that Corps. My uncle Trevor is the 1st trombone player in the photograph. He has lived for many years in Bargoed and, to my knowledge, is still blowing the trombone in the band at Treharris Corps. 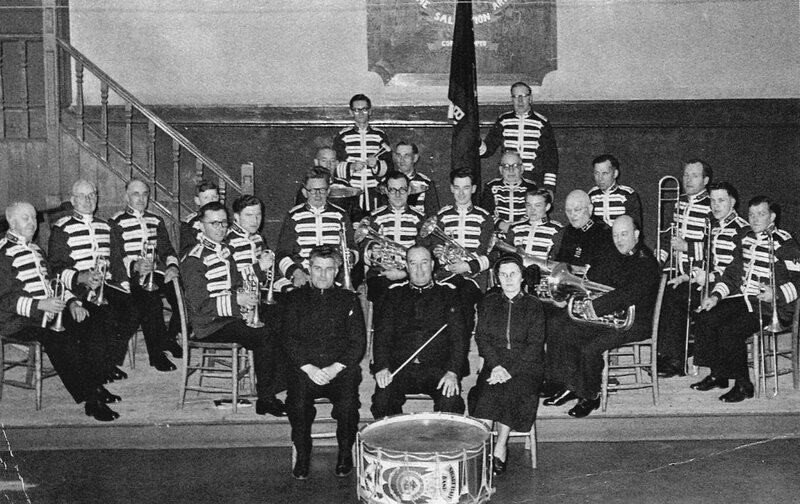 His youngest brother Peter is the baritone player wearing the 'lion-tamer' tunic next to the two euphonium players in navy. I know my grandfather played flugel horn (the 'lady of the band' as he used to call it) for many years but I'm sure it's not him in this photo. The bass trombone player is Cliff Townsend - another who remained a close family friend until his death and whose path we crossed again when we moved to Torquay (where he and his wife Frances had 'emigrated' to).